So, I know I said I was thinking about making you guys a cake. But, cake turned into something a whole lot more healthier…for now. A recent post from one of the bloggers I follow piqued my interest. 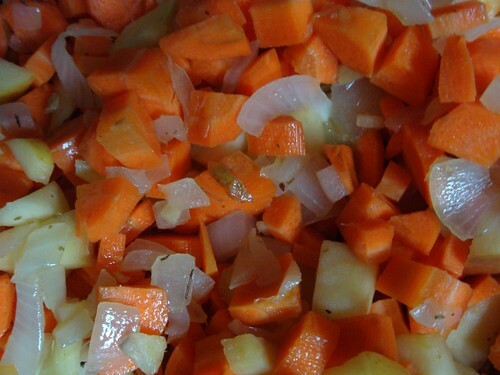 She blogged about making a soup that sounded delicious. 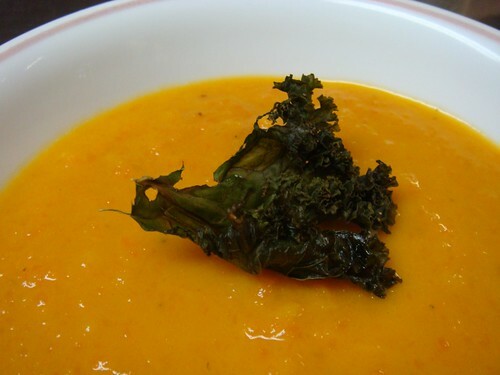 A Carrot Ginger Coconut Soup with a side of Kale Chips. I quickly filed it away in the back of my mind for when the stars align and I find myself with lots of carrots and needing something to do with them. This past Saturday at my local farmers market, low and behold, carrots were suddenly there! At only $1 a pound for (what I will assume) freshly pulled carrots, how can I pass? Then at the next vendor, Kale was available at $1 for a huge bunch! The stars are telling me to make this soup! – I had an apple sitting in my fridge. It has been sitting there since I moved in back in May. It’s a little wrinkly, but still good. It’s actually very sweet. I’m super sensitive to over ripe apples, so eating it straight up isn’t an option, so I decided to throw it in the soup. 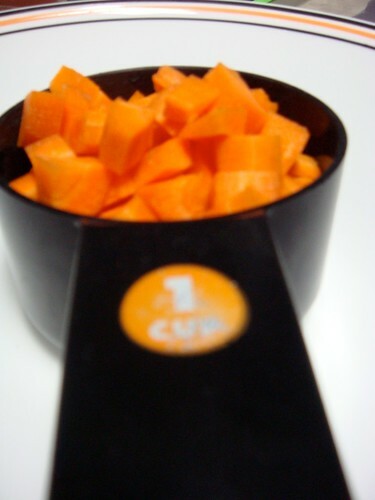 I de-cored an apple and rough chopped it and added it into the mix with the carrots. I kept the skin on because in the end, everything is getting pureed anyway. Extra shot of natural fiber! – I had no ground coriander on hand, and wasn’t going to shell out more money to buy a lot for a little that I needed. So I subbed in some Italian Seasoning. It worked. 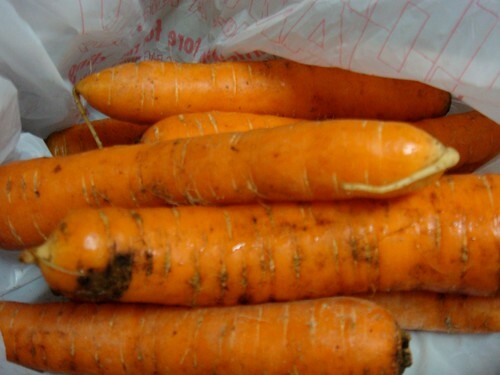 – The amount of carrots that I bought gave me 5 generous cupfuls of roughly chopped carrots. 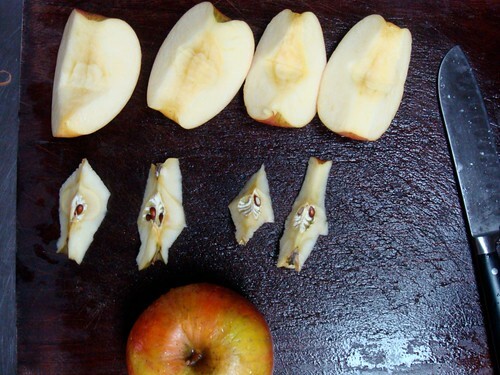 It really doesn’t matter how well you chop it, as long as they are just about uniform in size. Smaller pieces means it’ll cook faster. 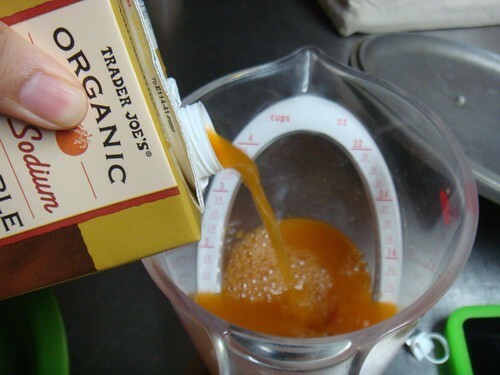 – I used 4 cups of Veggie broth (it doesn’t have to be organic, but low sodium is preferred). With the addition of the apple, three cups was going to produce some super thick soup, so I added an extra cup. – I got the curly edged Kale, and de-stalking it is really easy. 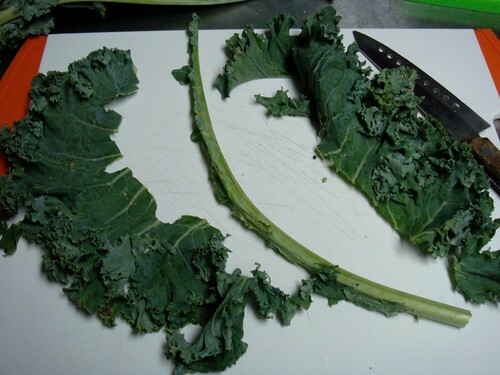 It naturally wants to fold over, so just let it fold and take a knife and trim it along the stalk at the edge. Voila! De-stalked kale. 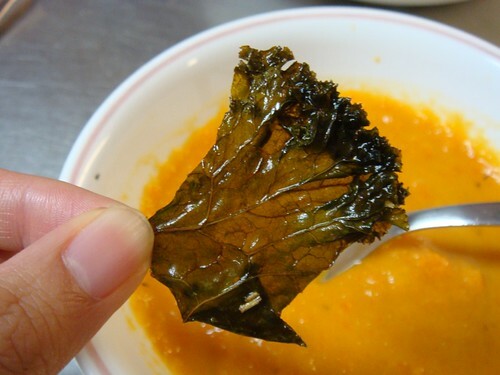 – I made two sheets of Kale chips. The first sheet, I used Old Bay seasoning (no need for salt since it has salt in it already). The second sheet, I used kosher salt and dried crushed rosemary. I ended up with 6 bowls of soup and enough Kale chips for four people (who really liked it). The soup was thick and really yummy. The coconut milk made it smell fabulous. The ginger came through and lent a coolness to the soup, while the apple naturally sweetened it up and made it perfect for fall. All three of those ingredients can be adjusted to preference. Next time I’m probably going to add more ginger because I really like ginger. But, if you don’t care for it, I’d suggest adding a little less. I don’t add salt very often to my cooking (which probably helps explain why I have a super low blood pressure), so while this came out flavorful, you might want to taste it and add salt and pepper to taste yourself. The Kale chips were surprisingly good. I personally liked the one with the rosemary better, but it may have also been because it was seasoned more? Who knows, but, rosemary definitely works in this application. For the rest of the pictures, go HERE! This entry was posted in Soup and tagged Carrots, Kale, Soup, Vegan. Bookmark the permalink.